Since guns are such tempting targets for burglars and criminals, it helps to keep them stored safely. This safe protects both your investment and the people around you from potentially armed criminals. 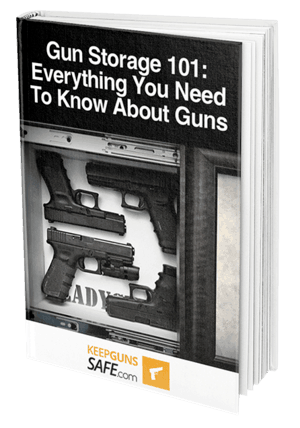 You have several ways of storing your guns at home, but most of them consist of a broadly similar design. This design consists of a container, which can vary from handgun to rifle size, made of a hardened material such as reinforced steel. This container typically features a hardened lock with one or several methods of entry. The defining characteristic that decides whether the design is classified as a gun safe or a gun cabinet is the size. If the aforementioned hardened container is sized to accept rifles, it is considered a cabinet. If your gun storage only fits pistols, it is typically classified as a gun safe. Gun safes typically include several other features when compared to gun cabinets. Many ​​good firearm safes on the market​ are designed to be quickly accessed, featuring a drop down door or similar design, so you don't have to waste time opening the door yourself. Gun cabinets are usually too loud or cumbersome to make this option viable on more affordable models. Many gun owners typically have a gun safe as well as a gun cabinet. This is because a gun cabinet is the ideal storage space for the weapons you usually take to the range as a concealed carry or don't plan on using to defend your home. One of the first things to consider before you decide to purchase a gun safe is the type of lock you expect it to feature. This can have a rather substantial effect on its usefulness in the event of a burglary or similar situation, so it helps to decide just what you intend to do with your gun safe before deciding on this. The most affordable option for a gun safe is a simple lock and key system. This lock has the disadvantage of requiring a separate key which must be kept somewhere near the safe or on your person at all times. This feature makes the lock and key safe the easiest to break into if the key is not hidden well. This can be applied when you're making a DIY gun safe room. More common is a combination lock. These can be of either the mechanical or digital variety, relying on dials for mechanical models or keypads for digital models. These are effective but not very fast in a dangerous situation. The newest and most effective type of lock is the biometric variety, which scans the user's fingerprint and only opens in the event of a match. These are ideal for home defense situations because you only need to press or slide your finger against the pad for the safe to open. 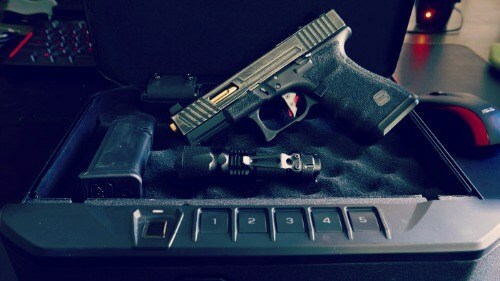 Most recently, this biometric technology has appeared in firearms and weapons as well. 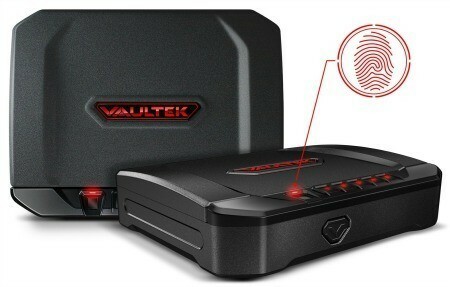 If you are looking for a home defense handgun safe which is as modern as possible, the VAULTEK VT20i provides the latest in safe gun technology. Its features include Bluetooth app compatibility, a fingerprint scanner, several anti-tampering measures and robust, resilient construction. This gun safe from VAULTEK is one of the most impressive models we have ever reviewed. While it is more expensive than some of the competition, it is not that much less affordable than many other biometric gun safes. In return for spending a little bit extra, you get a product which is markedly superior. It features a design which is meant to be resistant to the most dedicated of burglars, featuring anti-pry bars, interior hinges, and impact resistant latches. The safe consists of 16 gauge carbon steel, so you can rest assured that it will resist any foreseeable attempts. There are a wide variety of extra features included which aid in making this safe as user-friendly as possible. For example, the Bluetooth app allows you to change the lighting brightness, view how much time is remaining on the battery and even unlock your gun safe remotely. This gun safe is truly worth every penny. We took to the internet to see if customers were as impressed with this gun safe as we were. The results were very positive. Most customers were as impressed with the build quality﻿ of this safe﻿﻿ as we were, with many praising the quality of the keypad and the smooth mechanism of the hinges. Another aspect which was positively received was the inclusion of rechargeable batteries, saving on long term costs. Regarding negatives, there was not much, but some customers took issue with the fact that this gun safe is designed only to fit one gun comfortably. 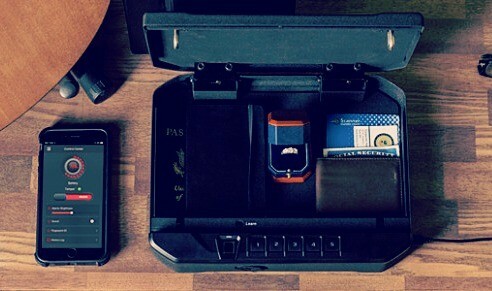 It is capable of fitting two but at the cost of extra storage space. As we stated earlier, this gun safe is one of the more expensive options, but it also provides some of the best value for money when compared to competing models. It can be found on Amazon for about 260 dollars. If you are looking for the best quality gun safe designed for a single handgun and you are willing to spend a little extra, we highly recommend the VAULTEK VT20i. If you have any concerns or any questions, feel free to leave them down in the comments section below.